Three years ago I received a call from Marty Bloom. He had recently returned from playing the Maccabian Games in Israel and had been appointed the new chair of the Grand Masters Tennis Team for the 2013 Games. He had gotten my name and wanted to know if I would be interested in being the coach. In the midst of mourning the loss of my wife, Carol, and about to have a second major surgery on my hip, I didn’t have a clue where my life would be three years hence. Marty didn’t know what was going on in my life and continued to pitch me enthusiastically. To get him off my back I said yes I would do it, figuring I had plenty of time to bail out once I could even think clearly about it. Over the three years my life has changed in wonderful ways. I met another angel, Jo Ann, with whom I fell in love and married last summer in the mountains of Colorado. 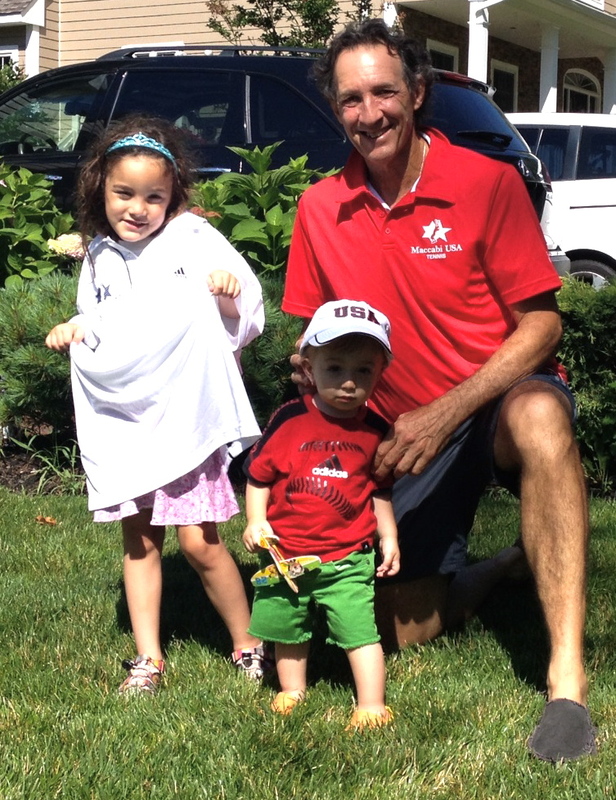 I had two more grandchildren, boys Soren and Julian, to add to my little girls Mischa and Madelyn. My family expanded to include Jo Ann’s three daughters Melissa, Brittany and Katie and three grandchildren. With my daughters, Jody and Amy, I am surrounded by a bevy of strong and beautiful women. My work as a coach exploded as I further developed my program of helping people move into better stories in their work and life. I met the amazing Suzanne Kingsbury, book editor extraordinaire, who has taken my hand and led me to completing a book that has been on the perimeter of my work for 30 years. The process has been as difficult and fulfilling as any I have lived. My tennis game has come back and, despite thinking I might never compete in singles again because of my hip, I have climbed back to the top of the game, last month, briefly grabbing the #1 USA ranking in the 65 and over and last week being one of four USA players appointed to the prestigious Senior Davis Cup team to compete in Austria in September. Sunday I board the plane for Israel where my team of 25 Grand Masters players will be participating in the largest sporting event in the World this year. Over 6000 athletes from 80 countries in more than 40 sports will be competing. On Thursday I will have the honor of marching into the Teddy Stadium in Jerusalem as one of over 110o athletes (ages 14-84) representing the USA in front of over 35,000 spectators. The Maccabian Games are the Olympics for Jewish athletes worldwide. I never would have imagined how amazing this journey of the last three years would be. I have met and coached 25 men, each successful in their lives in multiple sectors, who are now looking for success in a new world of tennis competition. Through emails and phone calls and one weekend together I have coached them in much that I have learned about the mental side of the game, encouraging them to work on their stories more than on their forehands and serves. To get clear on where they are and where they want to be. Seeing many of them buy into my methods of improvement and witnessing the changes is like winning tennis matches for me. A feeling of self satisfaction that helps me fulfill my passion of helping people grow. As for my tennis, I have been blessed to play in many special locations, Amsterdam, Hanover, Perth, South Africa, Turkey, Israel, Belgium, Monte Carlo and many big moments like the World Championships. But this event, the Maccabian, this time, feels so very special. I get to merge my love for tennis and my pride of being a Jewish tennis player. My excitement level is off the charts as I prepare to go to Israel again, 30 years after I first played there. At that time I was still learning to compete and was fortunate to bronze medal in the singles, needing only to play one tough match to advance to the medal round. I was fortunate to have a great strong partner, Steve Gottlieb, in the doubles and with him carrying the load we won the gold medal in an historic 6-7,7-6,7-6 final. This year, though, I will show up as a complete player and I am eager to bring my very best to the competition. I aspire to achieve my mission in this very special moment in my tennis life. I have been preparing with my regular disciplines of meditating, writing stories of who I intend to be and practicing on court. As usual there have been people that are there for me and help me as I get ready. Thanks to those who have hit with me: Junior players Daniel Weitz, Jack Goldman, Max and Austin Egna who, by letting me teach them I continue to learn. Jeff Snow, who runs down my winners, John Mcconnell, who provides constant feedback, Martin Wostenholm, who has taught me the long/short game, Kyle Permut, who wears me out when we play, Jimmy Malhame, who always teaches me so much about how to fight until the very last point. Kelsey, Samantha and Brianna, the brilliant collegiate runners that I coach, who inspire me every day with the devotion, discipline and ability to run through the pain. To Drs. Brian Hainline and Maxime Buyckx, who educate me in how to take care of my body. And to Jo Ann, who has come into my life and relit my flame. Every day with you is shoshin. We are here in Israel with 900 Open and Junior athletes awaiting the arrival of 250 Masters athletes. Three years of preparation will result in this extraordinary experience. 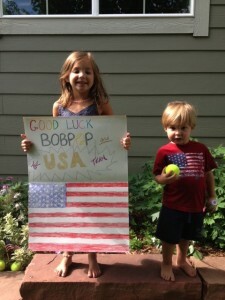 Good luck Bob & to the rest of the Grand Masters tennis team. Special good luck to Dan Burack, who I have had the pleasure of training these past few months, and his partner Harris Barer. Also to my pals Paul Slayton & Jim Schreiber. Have a great trip men & play well. Cant wait to share the experience! Enjoyed reading your blog. Been a follower of your writings for years. Bob, you have always been on my radar screen when I taught my students, working in the corporate world and now coaching a group of collegiate tennis players both men and women. Your wisdom leaves a lasting impression with everybody in your wake. I am honored to be here as your assistant in these games. Can’t wait to see you compete and work with you to have this team be successful in Israel. What an amazing experience for you and JoAnn. Enjoy and we look forward to hearing about the matches and the trip. Good luck, Dad! We’re so psyched for you! Bob; Best of luck. Enjoy the experience. Bring back a gold. You will do well and the experience you will never forget. Have a wonderful journey and experience, Bob. I am certain you will be ready for play! Warmest regards, David. Great trip Bob, you constantly strive to improve in every aspect of life. Watching you strive so hard motivates me to continue pushing hard. No matter what our age the future is awesome. WE WISH YOU A SAFE AND WONDERFUL JOURNEY. IT WILL BE AN AMAZING EXPERIENCE. WE WISH YOU SUCCESS AND YOU WILL CONTINUE TO MAKE US PROUD OF YOUR ACCOMPLISHMENTS. Epic moments are just ahead and I am sure this journey will be unforgettable! Can’t wait to hear all about it. Best of luck! Love you guys! Bob, best of luck. I’m sure you’ll appreciate the experience and renewed opportunities you have been given. Best of luck to you Bob! Your philosophy is HEAD-ON and we know you will accomplish all your dreams! Joanne – enjoy every minute of this with your husband! SO EXCITING! SO EXCITED FOR YOU!! MAY YOU FIND THIS EXPERIENCE AS ANOTHER WIN-WIN FOR YOU. Enjoy the ride Bob. You have my life so much better by your guidance and example. What an exciting and wonderful experience this will be with so many memories to share. We look forward to hearing all about your trip to Israel with JoAnn! wishing everyone a great experience and great play. It is so special for all of you to be together and p,aging for our great country USA!!! Go team…..